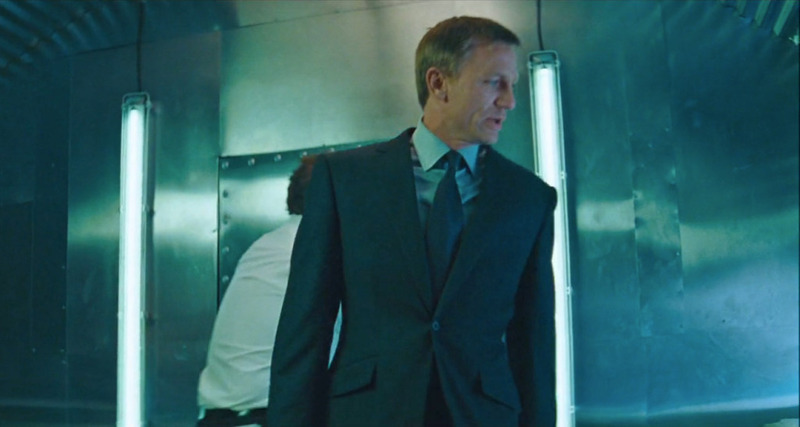 In Daniel Craig’s “screen test” for James Bond, the 2005 film Layer Cake, he wears a ready-to-wear navy suit from Kilgour. The suit was designed by Kilgour’s creative director Carlo Brandelli in his signature style. Brandelli, a London-born fashion designer, interior designer and artist, joined Kilgour in 2004, left in 2009 and returned again in 2013. The style of the suit recalls traditional Savile Row but at the same time updates it with a distinctive sleek, modern look. The suit jacket has single-button front with the button at the waist, and the jacket’s quarters gently cut away below the button. It is cut with a clean chest, a nipped waist and lightly-padded shoulders with roped sleeve heads. The jacket is detailed with a single vent, slanted flap pockets and four buttons on the cuffs. The jacket’s buttons are made of black horn. The suit trousers have a medium rise so they sit only about two inches below the jacket’s button. The rise is high enough to prevent the shirt from showing the jacket’s single button. The trousers have a darted front, straight leg, slanted side pockets and “DAKS top” side adjusters with three mother of pearl buttons. Daniel Craig’s shirt is pale blue and has a moderate spread collar, double cuffs and a front placket. Though the collar and cuffs are stitched 1/4-inch from the edge, the rather narrow placket is stitched 3/8″ from the edge. The placket is just like what Thomas Pink makes, and this shirt and the others in the film could possibly be from there. If this shirt isn’t from Thomas Pink, it is certainly English in origin. The navy tie has a raised woven honeycomb texture, which looks like the “Astaire” tie that Thomas Pink used to sell. Craig’s shoes are black leather high-vamp slip-ons with an elastic strip across the instep under the tongue. 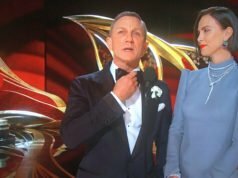 The entire colour scheme of the outfit is very Bond-like, and all the blue brings out the best in Daniel Craig’s warm, spring complexion and blue eyes. Though the clothes are ready-to-wear, they fit well except for when the jacket’s collar stands away from the neck. Daniel Craig looks great in the English style and proves in Layer Cake that he can look very much the part of James Bond. 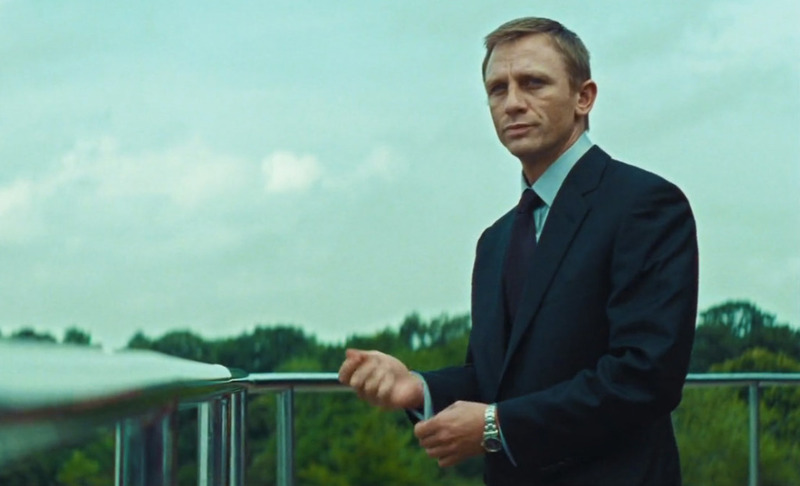 In 2011, I wrote about the cream suit Daniel Craig wears in the final scene of Layer Cake. That’s fantastic! Thanks for posting the link. This is indeed an almost perfect example on how well a mid blue suit fits a man with Craig’s complexion. I also like the monochrome “all blue” look. Only the jacket’s single vent and one-button front bother me a little but that’s marginal. That last pic is terrific. Except for the single-button closure, this is reminiscent of George Lazenby’s suits. It definitely makes Craig look taller and slimmer. It’s funny, he looks more like James Bond in this suit in this film than he does when he is actually supposed to be Bond in the Bond films. Well that’s not quite fair, the Quantum of Solace suits were on the money to be fair but you get my point. 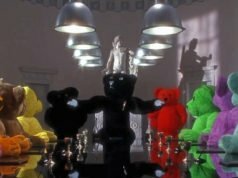 I’m anxious to see what the suits are like in the next bond movie. Hopefully the custume folk will read “thesuitsofjamesbond.com” for ideas one what the fans want. I agree with what you said Ryan. I also think Craig looked his best in QoS and would very much like a return to those cut of suits in the next Bond Movie. However, I am honestly not too optimistic about this. The massive success of Skyfall has apparently made the producers eager to repeat the same formula. From what I heard so far, the next movie will have the same director and screenwriters. I’ve even read rumors of Adele returning for the opening theme song. So it’s quite possible that we’ll get the same costume director as well. Bond 24 doesn’t start filming for two months, so his hair could possibly be a little longer for the new film. The very short hair isn’t flattering to his hairline and makes him look older. I must admit I didn’t notice this suit when I saw the movie a few years ago. But now I agree with everybody here that it’s a great look on him. The monochromatic blue color does look good and it personally reminds me of Connery’s Bond. Matt, the “clothes and pose” comment cracked me up. 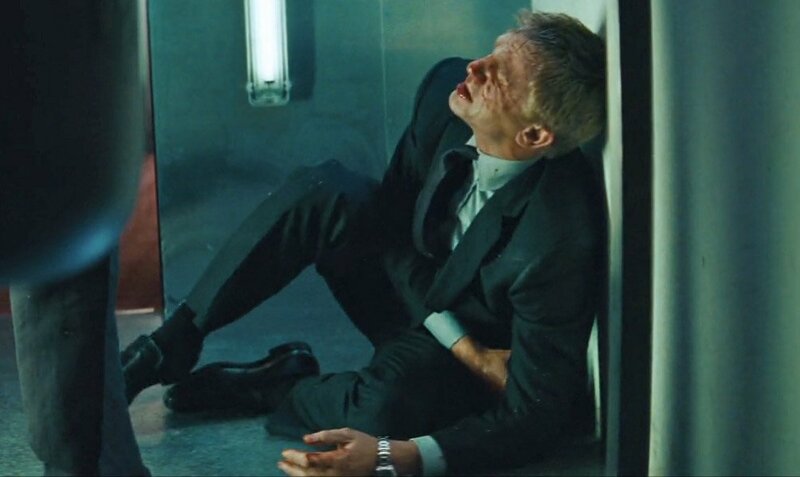 I guess it is very like Craig’s Bond to adjust his cuffs. 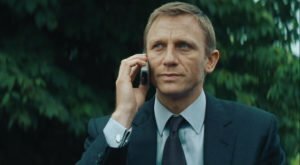 I find it interesting that the director of Layer Cake, Matthew Vaughn, was also at one time considered for Casino Royale. I wonder how that might have turned out. It’s likely that I will cover that film after it comes out. Matt, any chance to get a picture of the DAKS top trousers, please ? It’s the first time I saw a ready-to-wear brand offering it. I still wonder why Anthony Sinclair doesn’t offer them in their ready-to-wear branch, by the way. Anyway, Craig looks great here, and he actually looks much taller than in his previous Bond movies. Perhaps it’s because he was slimmer here, I don’t know. But he definitely looks the part, and I wonder if all that bulk was really necessary. The haircut is better, too. The colour scheme, the accessories, everything looks great here. It both recalls classic Connery and Lazenby style. Much more elegant and certainly less flashy, expensive-looking than Tom Ford, in my humble opinion. If you want to see Kilgour’s side adjusters look up their suits on eBay. I’m not sure if they still make them that way. I’m guessing Anthony Sinclair has gone for the more typical Savile Row-style side adjusters because they work better than buttons and elastic. I’ve never found the button kind to be very effective.